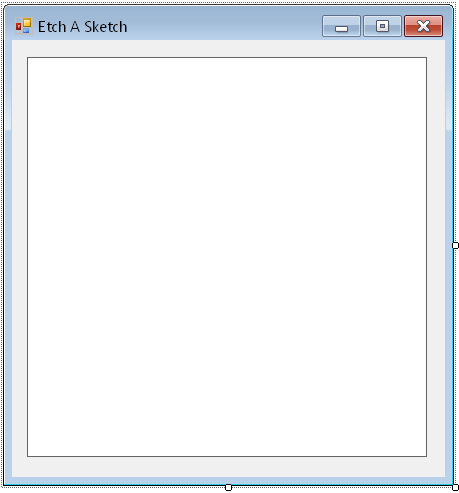 This page contains the instructions for building a simple Visual Basic Etch-A-Sketch program that can be used with a suitable Arduino sketch. The idea was to take advantage of the features of some of the Arduino family (eg Leonardo, Micro) that allow keyboard and mouse to be emulated. The program draws when the arrow keys are pressed. We'll start by making the program in Visual Basic. These instructions are for Visual Basic 2010 but should work in any desktop version of Visual Basic from 2005 onwards. You need to start a new Windows Forms project in Visual Basic. Change the Text property of the form to the name you want to give your program. Find the KeyPreview property and set it to True. That means that we want key presses to be processed by the form and not by any of its controls. Next, add a PictureBox and name it picSketch. Make it 400x400 pixels by changing its Size property. The first variable stores the location of the 'cursor'. We start with the cursor in the middle of the drawing canvas. The second variable is a bitmap that will be used to store the sketch we are making. You can test that the program compiles and loads successfully, drawing a 1 pixel dot in the middle of the PictureBox. This will get you started. Essentially, it changes the position of the current point by 1 pixel, depending on the key being pressed. It then updates the display. The reason for not putting the call to UpdateDisplay only once at the end of the sub is so that it only happens if there is change to the cursor position. This is my preferred component for this idea. With 2 encoders, you use one to send left and right keypresses and one to send up and down key presses. If you only have one encoder, use a rocker switch or something similar to change it from up-down to left-right mode. You can make this work with a couple of trimpots. It's a bit harder to control the amount of change but not impossible to get something usable. Although an analogue thumb joystick is basically a couple of potentiometers, you would find it easier to use. Your Arduino sketch would need to make a dead zone around the centre position of the stick. When the stick is pushed beyond a given threshold, the relevant key press can be sent to the PC. A Wii Nunchuck would also fit the bill here. The larger arcade-style joysticks are usually a set of switches. That would be perfect for this scenario, since we want to have individual key presses sent to the PC. Not the coolest, but the easiest to set up. 4 buttons, one for each direction...easy. You could use a Wii Nunchuck's accelerometer for this. If you have access to a USB host controller, you could also use a PS3 controller's accelerometer to do this. With an accelerometer, you probably want to have a button that needs to be pressed down for the movement to be converted into key presses. As with any component that gives you a range of readings, you need to set a threshold for the movement you replicate on the screen. If you want to avoid programming an Arduino and have a Makey Makey, whip it out and build some switches out of anything conductive. You could use one of the capsense breakout boards (both Sparkfun and Adafruit have products for this) to achieve this. Alternatively, look on the Arduino site for information about the capsense library and have a go at setting this up without having to get any new components. A handful of piezo elements, some 1M Ohm resistors, and you can use vibration sensing for the control. These are just a few ideas of the components you might use to create an interface for this program. There are lots of other options you might explore too. Any sensor or input component could be considered - the more bizarre, the better. Imagine using a couple of wind sensors (not the cheapest option) and controlling the program by blowing. Maybe you want to wave your hands in front of a light, infrared or ultrasound sensor. You could move a robot around and have the drawing correspond to the path you drive the robot. The possibilities are limited only by your imagination. The program could do with a few tweaks. It would be useful to have a way of clearing the screen without having to restart the program. You can clear the bitmap with bmpSketch= new Bitmap(400,400) and a call to UpdateDisplay(). It might be nice to have to shake something to clear the screen. A button would be enough though. You would get your sketch to send a keypress and adapt the program to clear the screen when that particular key is pressed. You could also add a feature to center the cursor.